I've been receiving lots of questions about my ornament edgings, so here's how I do them. Backstitch matching fronts and backs. I always do these over 2 with two threads. I always start the whipstitching with a loop. When I get to the hanger, I put a small knot in my ribbon or cording, so that the end doesn't accidentally get pulled out. Then, I weave a stitch or two through the backstitches and ribbon. And then continue on with the beading. My last stitch is always stitched through the beginning stitch. And then I thread the needle under the whipstitches and clip the end close. The top ornament has beads every other stitch. The bottom ornament has beads every third stitch. Wonderful tutorial! Thank you Staci! You do such beautiful work Staci. The tutorial is very clear. As I live and breath I learn something new every day from someone's blog and today I learned from yours! Thanks so much. The directions are so clear! thanks for the instructions, absolutely fantastic. must have a go, finishing things is not my best thing. Thank you for sharing this technique Staci! You have explained it so well, and the photos help too. I am like Kath: my finishing needs a lot to be desired. I will give this a go with my next xmas ornie...a lovely finish! Beautiful Staci - that's exactly how I do it too! Thanks for the great info, Staci, on the ornaments and the washcloths. 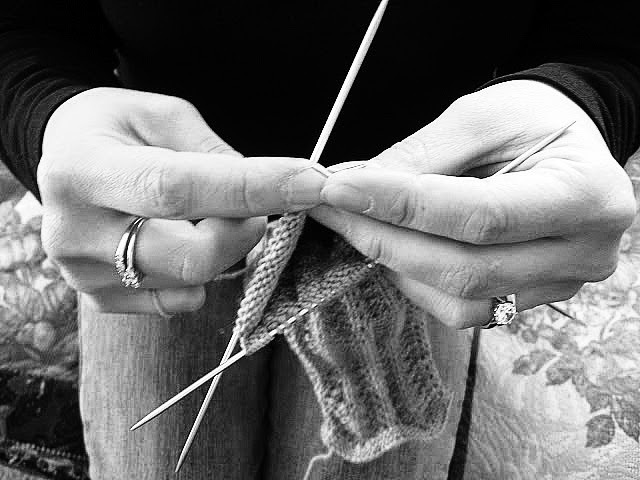 Of course, the only thing I can still remember about knitting is cast on, knit and purl ... lol. I think I need a refresher course. I haven't tried putting beads on ornament edges, but that'll be fun to try soon. An easy-to-follow tutorial. Well done! Very nice photos too. I've never added beads to my whipstitched edges but I plan to now! Thanks for the tutorial! I will probably get more ornaments finished if I don't have to use the sewing machine! Thank you so much! Everyone makes it look so easy - I guess I just have to dive in and give it a try. Oh, now here's my silly question. I've been whipstitching biscornus and ornies shut for awhile (but never with beads.. one of these days!) and I always worried about knotting the end and pulling it through to the inside of the sewing. Looking at your instructions you don't appear to worry about knotting the end of your thread when you finish.. you just pull it under the previous stitches? And it doesn't pull out? I think I will love you forever. This was the most frustrating part of finishing for me. =) heh. Ooooo pretty! Very, very pretty. Congrats on your lovely completions. This makes it very clear. Thanks for the tutorial of the beaded edges as well as for the one about your wash cloths. Your ornaments are so beautiful Staci. Anyone would be lucky to receive one of these as a gift! Thank you for this tutorial Staci, I'm going to try it out later this weekend! Add me to the list of stitchers who are grateful for this tutorial, Staci. Nicely done! Thank you so much. They were so clear except for when to put in the stuffing LOL. I learned from you today. Thanks for the tutorial Staci. You explained it very well and great pics too. I am going to give this a try! Staci, thanks for the great tutorial. I always wondered how your ornaments were made. Hopefully mine will be as beautiful as yours always are. Take care! Brilliant explanation with great pics too. Thank you so much for sharing. I am always looking for new finishing ideas. This is my first visit to your beautiful blog. I really enjoyed reading back over a couple of months. Wow!! You have some terrific stitching and knitting going on. Of course, I just love the life saver dish cloths, too cool, and really, what a great idea. Heaven help me, I just might have to dig into my yarn stash -- and that hasn't been touched in a few years, but there is a lot of it. I am so glad to have you joining us for the Christmas Design SAL -- the more the merrier. And next year you just may get one of those big projects that keep hitting you in the eye done in time for Christmas (LOL). I'll certainly be back to read about what else you're doing, you make it look like such "bliss". I love this kind of finish. Now all I need is beads in every colour under the sun...LOL!! Thanks for the explanation. Your finishes are always so perfectly done. Great tutorial - love your projects. I have a silly question - is the backstitching enough to keep the edges from fraying. Do you backstitch, trin the piece and then whipstitch? Don't laugh but I am confused - seems to me that the edges would fray. Thanks for your help. Thank you so much for your tutorial. I don't sew and this sounds so easy. I can't wait to try it. Thanks so much for the tutorial! I love the beaded edge! I'm going to use this method like crazy! Thanks for the tutorial. I am always looking for ways to finish ornaments(it's half the reason I don't like stitching them--I never know how to finish them). Thanks so much for the visual tutorial, Staci! This is the way I finish my ornaments--when I do my own finishing. I could never get the hang of the beading OR the ribbon hanger. Thanks for the help for the visual learners! W.O.W.! and thank you for that tutorial. I don't do well with finishing, but this may help me tons! Thanks for the lovely tutorial, very beautifully stitched! Thanks for this tutorial. This is most helpful.